Two CIF champion coaches and one legend have been selected to coach the upcoming San Gabriel Valley All-Star Game on Jan. 30 at West Covina High School. Colony’s Steve Randall, who guided the Titans to a 12-2 record and Central Division championship, will coach the East team. Crescenta Valley’s Paul Schilling, who led the Falcons to a 14-0 record and the Southeast Division championship, will join forces with four-time CIF champion coach Steve Bogan of Maranatha to coach the West. The game, which has traditionally been played in early summer, was moved to winter by game organizer and West Covina coach Mike Maggiore in order to provide players with one last recruiting showcase before signing day and hopefully lure some of the area’s top talent. The borders have also been changed and expanded. Instead of using the 605 Freeway as the dividing line to determine East and West rosters, Azusa Avenue will be the new divider. This means that area powers like Bishop Amat, Los Altos and Northview will be part of the West’s talent pool. The West’s boundaries expands to the Burbank area. The East has also expanded out to the 15 Freeway and that will mean the inclusion of the entire Baseline League. The expanded borders have led to some impressive early returns in terms of nominations, according to Maggiore. Roster are expected to be finalized in early January and there will be four practices for each team. La Mirada WR/DB Tony Brown gave a verbal commitment on Thursday to play at Texas Tech next season. Brown, who transferred to La Mirada from Servite for his senior season, had offers from Colorado, Nebraska and UCLA but chose the Red Raiders because he developed a close relationship with Red Raiders assistant coach Darrin Chiaverini, who played with La Mirada head coach Mike Moschetti at Colorado. Brown caught 46 passes for 993 yards and 11 touchdowns this season. Monrovia WR/DB Octavius Spencer has committed to UCLA, thus ending any suspense long before Signing Day about where he’ll play on Saturdays. Spencer caught 31 passes for 691 yards and eight touchdowns. He also averaged 49.4 yards on kickoff returns and 23.9 yards and punt returns. Spencer recorded 44 tackles and had two interceptions while on defense. He was an all-Rio Hondo League selection on both offense and defense. It appears John Hardy is out and Muir High School’s varsity football program is in the market for a new head coach. A source close to the team said that Hardy was let go on Friday. Mustangs athletic director Milica Protic posted an ad on CIF’s website Friday saying that the school is looking for a new head coach with a teaching position available for the interested candidate. But when contacted, Protic said she is referring all questions about Hardy to the school’s principal. Hardy was 25-11 in three seasons as Mustangs head coach. He led the Mustangs to their best season in recent history in 2013 when Muir went 11-2, swept the Pacific League and advanced to the semifinals of the Southeast Division playoffs. Hardy played at Muir under legendary former head coach Jim Brownfield. Aram’s Take: I truly hope Muir has a good reason for this as Hardy did an outstanding job with a program that isn’t easy manage. Not only that, he was slowly but surely keeping key portions of the local talent at home. Hardy’s no-nonsense demeanor was perfect for Muir and the record showed it. Hope there’s a good reason for this. San Dimas High School moved fast to replace recently resigned varsity football head coach Bill Zernickow by promoting Mark Holman to the top job on Thursday. Zernickow resigned on Dec. 1 after a successful 10-year run at the school. Holman served as an assistant on Zernickow’s staff, coaching the offensive line and also being the offensive coordinator although Zernickow called the plays. 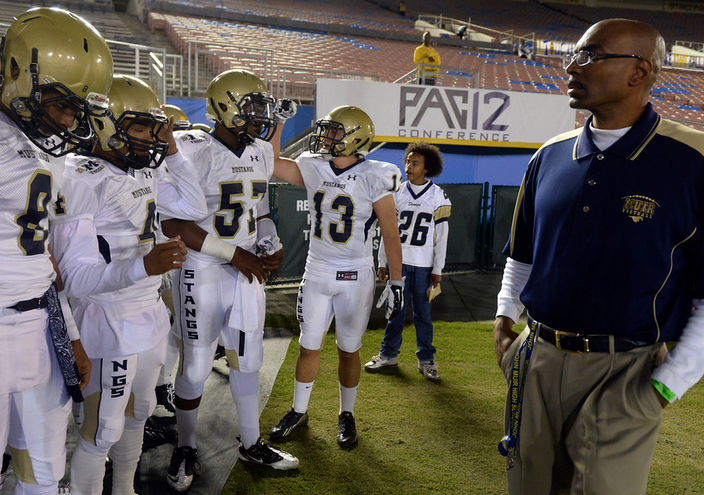 San Dimas will be Holman’s first head coach job. He has worked on Zernickow’s staffs at both Northview and San Dimas and doesn’t plan to change too much although the Saints’ offensive strategy likely won’t mirror what it was under Zernickow. Zernickow turned San Dimas into an area power after taking over a troubled program from previous head coach Roland DeAnda in 2005. Zernickow led the Saints to CIF championships in 2009 and 2013. “I wouldn’t have applied for the job if I didn’t think I could it going,” Holman said of San Dimas’ success. “There’s always going to be pressure. In any big job, there’s going to be pressure but that’s what makes it fun, too. Holman is hoping to retain whichever members of last year’s coaching staff wish to remain. With Zernickow having publicly stated that he’s looking to get back into coaching at a higher division, keeping the staff in tact maybe easier said than done for Holman.